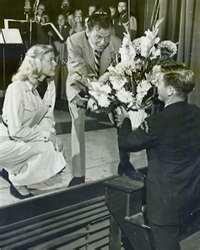 "I first met Doris Day when I was singing with my three brothers on radio station WLW in Cincinnati, Ohio. I was 14 years old. I had a crush on her then and I still do. She had a voice so fresh you could smell it. She's a terrific singer and a great lady." When Doris Day sings a song, whether it is on a record or a radio/TV show or even in a film, the listener takes it very personal. After all, that listener remarks, “she is singing directly to me”. It has always been that way…right at the very beginning. When she sang for her first music teacher, Grace Raine, the teacher imparted that lesson to her. 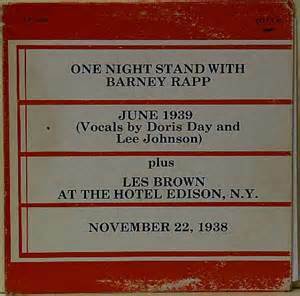 And the teacher was so impressed with the results that she got Doris her first jobs, both on radio and with bandleader, Barney Rapp, who changed her name after the way she sang a song called “Day After Day”. The singing had its magic way back then. HERE, Doris poses with Barney Rapp, the first band with which she performed, at his club in Cincinnati, The Sign of the Drum. Below is an interesting image found in an internet search. It advertises two separate performances about 5 months apart (1938-1939) but notice the coincidences. Not long after, it was Doris with Les. 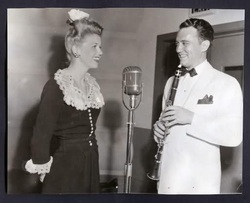 Doris with bandleader Bob Crosby, brother of Bing. After the time spent with Barney Rapp, Doris also worked briefly with The Jimmy James Orchestra and for three months with Bob Crosby and his Bobcats. No known recorded material exists from her time with either James or Crosby. Some bios also list a brief spell with Fred Waring and his Orchestra, but that has never been discussed by Doris in any books we have read or interviews we have heard. 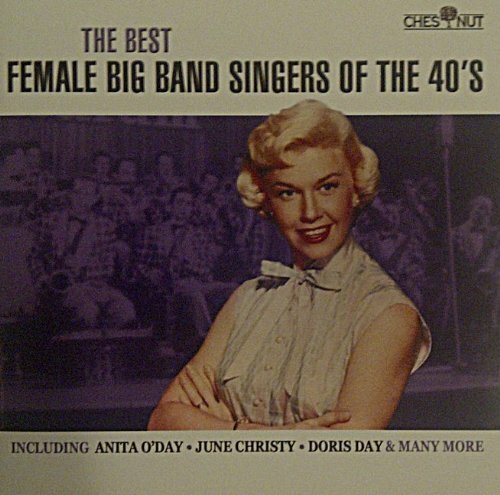 Here Doris poses front and center with the full Bob Crosby Band. 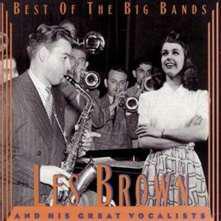 The magic continued when she performed with the Les Brown Band, on and off for 6 years. During that time, she had 15 sides that were in the Top 10, two of which were signature tunes for her at the time. “Sentimental Journey” is still mentioned when a discussion of the end of World War II comes up; it was the perfect song, the perfect singer, the perfect record to end the war and bring the guys back home. 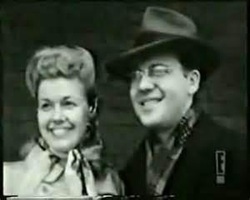 Doris and Les followed that almost immediately with “My Dreams Are Getting Better All The Time”, which knocked “Journey” out of its first place slot on the hit lists. Although Doris prefers to sing a slow ballad and she thinks that she does that best of all, others disagree and say she can sing anything with the best of them, slow or fast. That could be seen very quickly on her first few hits. Her first “single” hit recording was on a polka called “Papa, Won’t You Dance With Me”, followed by a duet with Buddy Clark on a double-sided million seller called “Love Somebody” and “Confess”. The listener did not have to see Doris to appreciate the beauty of her golden voice, what some have called a voice of velvet. But once you add THE LOOK to the VOICE, as Frank Sinatra said on YOUR HIT PARADE, “You’re hooked because Doris Day’s got the drop on you!” Doris co-hosted that popular radio show with Sinatra in 1947 and got the opportunity to sing lots of songs …songs she never recorded, mostly lost to posterity. Fortunately for Doris fans, not all of the songs were lost. Listen, as Frank introduces Doris to sing a couple of the popular songs of the time, from radio transcripts, now preserved on YouTube. Here, from one of those weekly Hope shows, are Bob and Doris dueting on a song they never recorded together . Doris was never one to sit around and rest. In the spur of all this activity, she was busily making her first movie “Romance on the High Seas” in 1948. In the UK, the movie was renamed after the song. 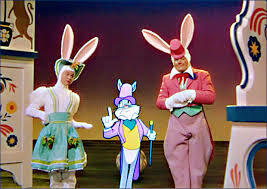 But the icing on the cake was a little song called “IT’S MAGIC” sung several times in the film. Each time, the listener sits straight up and becomes totally enraptured. Comedienne and TV star Betty White says of the song, “Every time Doris sang that song I got into trouble!” Actually, all the songs from this film, released as singles, were hits, especially on the 1948 jukeboxes. After SENTIMENTAL JOURNEY in 1945, and only three years later, Doris had another signature song, one that she continued to sing many different ways through the years. Let’s see…. 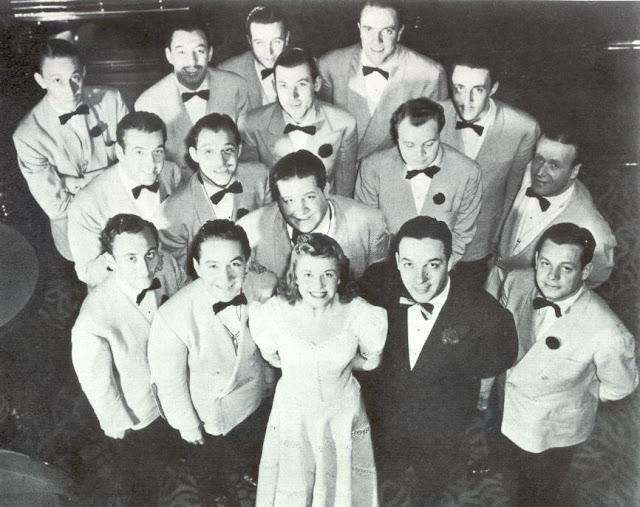 From 1948 up to 1950, Doris had over 15 songs that hit the Top 20. One thing that music researchers tend to forget is that not all songs become #1. Many never get higher than 2 or 3 in the Top Ten. That does not mean they should be ignored. 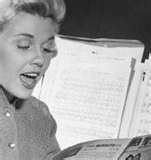 One example is another signature tune that Doris recorded with the Mellomen. It peaked at #2, but it charted for over 19 weeks. It was called “Again”. The flip side, “Everywhere You Go” also charted. (While Vic Damone also had a recording of “Again” that charted well. It is the Day version that gets the historical nod.) "Everywhere You Go" is a song that perfectly fits the personality of Doris herself and reflects the sunshine that pours out in her singing. Several other songs placed on various music charts in 1948 and 1949. 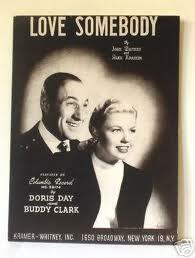 Buddy Clark & Doris Day hit with "I'll String Along With You". With The Modernaires, Doris pulled many spins on a little song called "Thoughtless". And she even tried a country mode with a group called "Her Country Cousins". "Quicksilver" hit the Top 20, but other chart entries included: "The Game of Broken Hearts", "I'll Never Slip Around Again" and "Crocodile Tears". 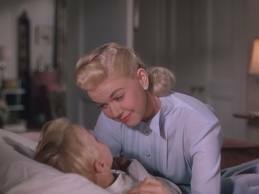 Doris sings "I'll String Along With You" to her son, Freddy, in the film. In 1949, there was yet another film, "It's A Great Feeling", her third with Jack Carson as co-star. 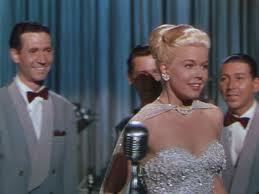 One of the songs Doris recorded in 1949 came from the Betty Hutton movie, “Red, Hot and Blue”. And although Betty had recorded the song, the release by Doris on the flip side of “Blame my Absent-Minded Heart” is the one that became the big Top 20 Hit. It was called: “(Where Are You) Now That I need You”. Question asked: "What did you think of that silly song, Doris?' Reaction is evident. 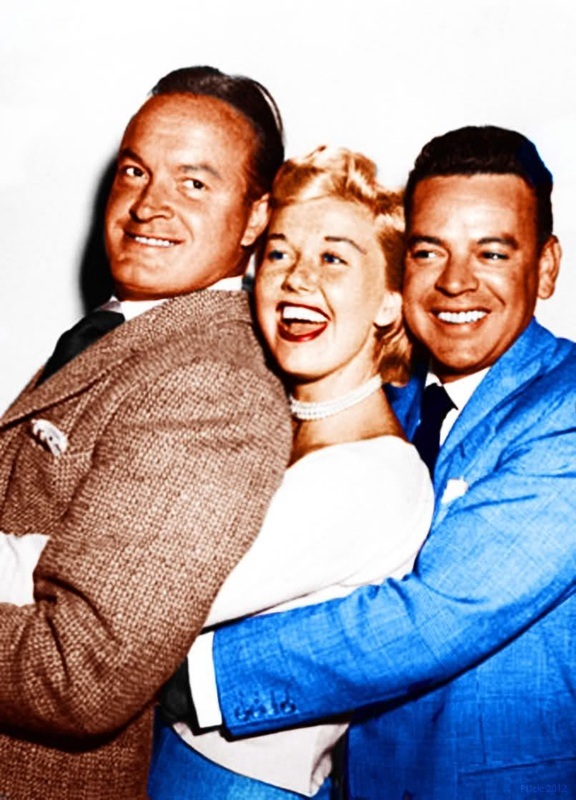 Four other songs made a mark for Doris in 1950. In May, came a special release from her first album, “You’re My Thrill”. The song was recorded by many, but it was Doris’s version of “Bewitched, Bothered and Bewildered” which was the one to hear. The flip side was a remarkable interpretation of another oldie called “Imagination”. Taken together, Doris ended up with still more signature songs. It is on these two songs that the listener can hear how Doris’s voice has not only matured in quality, but also how it retained what has often been described as the sound of honey. The other two charted songs from 1950 were two very different songs. One was a novelty numbert called "Marriage Ties", and the other was a beautiful ballad from the Broadway Show "Call Me Madam" called "The Best Thing For You (Would Be Me)". Historically, most singers are lucky if they span a period of 5 to 10 years. 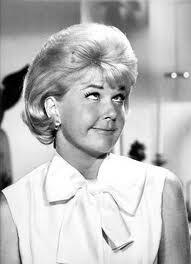 This is definitely NOT the case with Doris Day, which is why her music is so often described as Iconic. She began her career in the late 30's, and we have also looked at the 40's. Now, we are already talking two decades. But it does not end here, because her musical peaks came in the mid 50's. So move along with us to the next page.